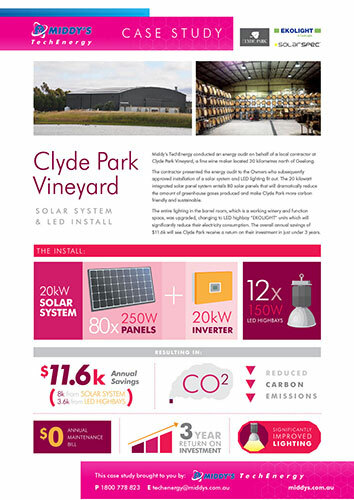 Middy’s TechEnergy conducted an energy audit on behalf of a local contractor at Clyde Park Vineyard, a fine wine maker located 30 kilometres north of Geelong. The contractor presented the energy audit to the Owners who subsequently approved installation of a solar system and LED lighting fit out. The 20 kilowatt integrated solar panel system entails 80 solar panels that will dramatically reduce the amount of greenhouse gases produced and make Clyde Park more carbon friendly and sustainable. Southwest business owners save money on energy and help sustain the environment with solar power panel installation. This story was published in Southwest Biz, Volume 27, Summer 2013/14. 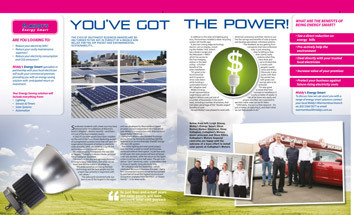 Warrnambool business Callaghan's Moters recently added 120 solar panels to the roof of their business. The results have been instant and positive by saving them on energy bills and making a positive environmental impact. 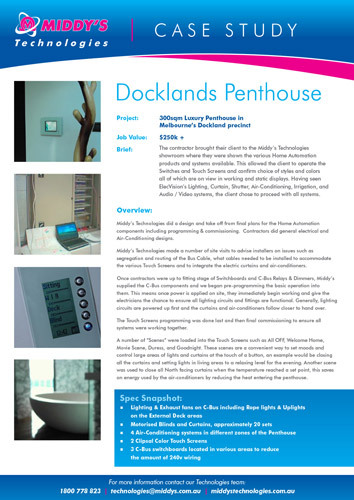 Middy's TechEnergy provided a residential automation solution for six TAC assisted living apartments in Abbotsford, Melbourne. These apartments will house a number of residents with acquired brain injuries & permanent injuries. C Squared Automation completed all the installation, programming and integration of Leviton's Omni automation system. Written on 09 October 2013 . 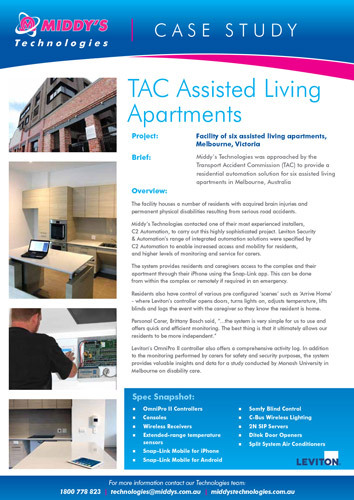 Middy’s Technologies was approached by the Transport Accident Commission (TAC) to provide a residential automation solution for six assisted living apartments in Melbourne. The facility houses a number of residents with acquired brain injuries and permanent physical disabilities resulting from serious road accidents. With a proven record for success demonstrated in past projects, Middy’s and Nilsens partnered with B&R Enclosures to supply the racks and equipment for the project. The project demanded critical requirements which needed to be considered in the partnership. These included adhering to strict delivery schedules for supply while also maintaining open and consistent communication between all stakeholders in the project. 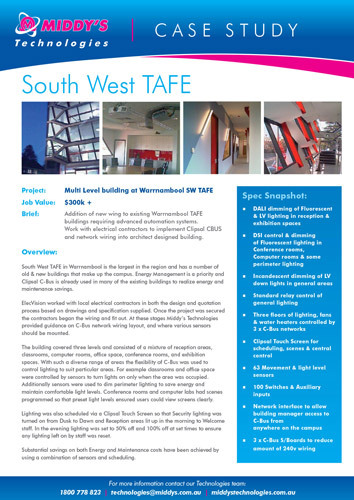 Addition of new wing to existing Warrnambool TAFE buildings requiring advanced automation systems. 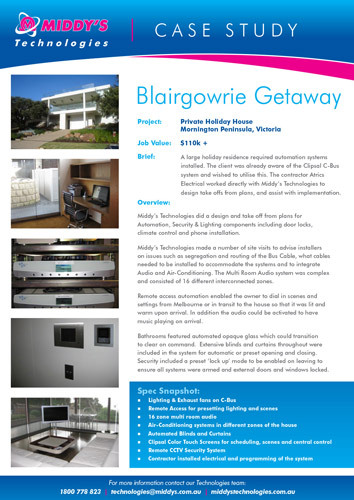 Work with electrical contractors to implement Clipsal CBUS and network wiring into architect designed building. A large holiday residence required automation systems installed. The client was already aware of the Clipsal C-Bus system and wished to utilise this. 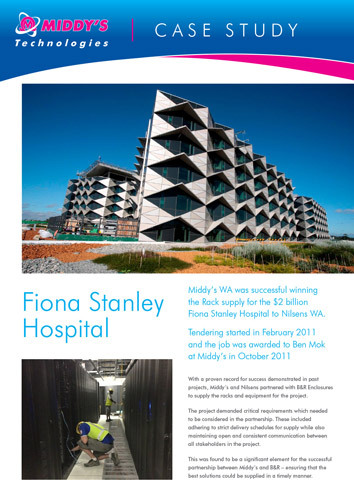 The contractor Atrics Electrical worked directly with Middy's Technologies to design take offs from plans, and assist with implementation. Written on 14 August 2013 . 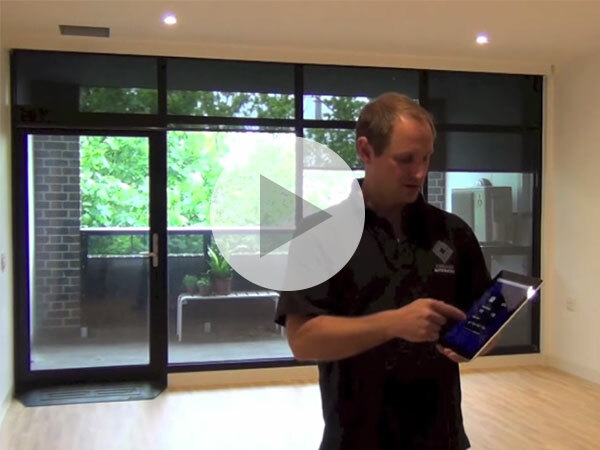 The contractor brought their client to a Middy's Technologies Smart Centre where they were shown the various Home Automation products and systems available. This allowed the client to operate the Switches and Touch Screens and confirm choice of styles and colors all of which are on view in working and static displays. Having seen Middy's Technologies' Lighting, Curtain, Shutter, Air-Conditioning, Irrigation, and Audio / Video systems, the client chose to proceed with all systems. 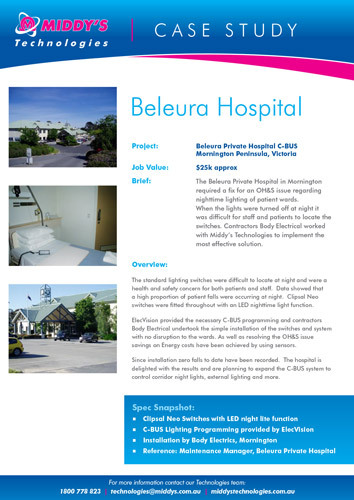 The Beleura Private Hospital in Mornington required a fix for an OH&S issue regarding nighttime lighting of patient wards. When the lights were turned off at night it was difficult for staff and patients to locate the switches. 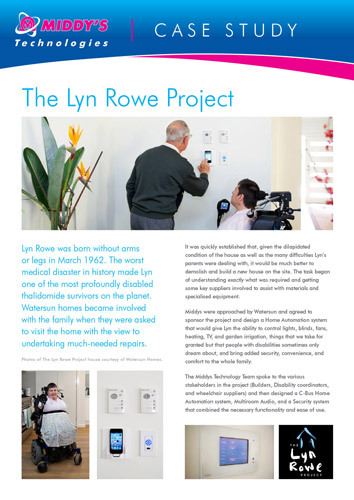 Contractors Body Electrical worked with ElecVision to implement the most effective solution.